When you picture New Zealand, it’s normal to instantly conjure up images of rugby, jandals, sheep and kiwis (both the furry birds and the furry fruits). It’s OK – we’re used to it. But New Zealand is so much more than just a collection of little islands at the bottom of the world. And contrary to popular belief, we’re not Australia’s side-kick either. Aotearoa, the native Maori word for ‘New Zealand’, is home to about 4.5 million people, roughly 39 million sheep, and, if Hollywood is anything to go by, a Shire filled with hairy-footed Hobbits. Whether you’re after adventure tourism, a sip of the best wine in the world, brag-worthy photos or a reason to relocate entirely, New Zealand is the perfect destination for your next travel adventure. Here are the top 10 cities to visit in New Zealand. Dubbed the adventure tourism capital of New Zealand, Queenstown is one of the most popular New Zealand cities to visit among international and Kiwi travellers alike. And it doesn’t matter what time of the year you visit either: Queenstown enjoys long hot summer weather and snow-filled winter weather. 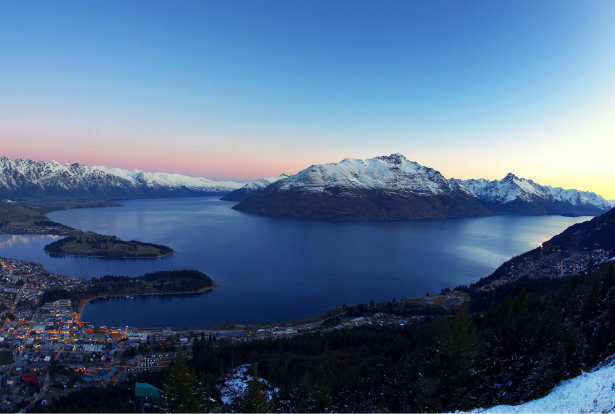 An alpine paradise with awesome skiing and snowboarding during the cooler months, Queenstown hosts the world-famous Winter Festival which is basically a great excuse to have a massive party in the snow. In summer, walking tracks, boat cruises and glasses of wine in the sun help you make the most of the warm sunny weather. And of course, there are loads of adventure activities to cross off your bucket list too, like jet boat riding on the pristine Kawarau River or AJ Hackett’s classic bungy jump. The largest city in New Zealand, Auckland is home to more than one million people – about a quarter of New Zealand’s entire population. Affectionately known as the City of Sails because it’s so close to the sea, Auckland offers a host of adventure tourism and travel activities like bungy jumping, jet boat riding and jumping off the Sky Tower, the tallest building in the Southern Hemisphere. But if you’re after a holiday that’s more laid-back, take a ferry ride across the Waitemata Harbour to Waiheke Island or a drive just 20 minutes out of Downtown Auckland where you’ll find world-famous vineyards and wine-tasting, not to mention pristine beaches. If it’s fine wine and dining you’re after, book a table at one of the many world-class restaurants in the Viaduct. And if your kids are on holiday too, check out Kelly Tarlton’s, Rainbow’s End or Butterfly Creek. Auckland really is one of New Zealand’s most diverse cities to visit. Nicknamed the Garden City because of its big wide open spaces, Christchurch remains a firm favourite for families and travel adventurers alike, despite a significantly-altered cityscape after a series of big earthquakes in 2010 and 2011. The second-largest city by population, Christchurch and the surrounding Canterbury region enjoys mixed weather: long hot summers and cold harsh winters, which is great for snow-lovers. The world-famous Antarctic Centre promises to give you an insight into the southern-most continent, without ever having to leave the sunny warmth of Canterbury. Take a walk on the wild side and drive out to Orana Wildlife Park, New Zealand’s only quasi-safari complete with big cats. And if you’re after world-class adventure like white water rafting, hot air ballooning and some of the best golf in the country, Christchurch is the perfect base to explore the rest of the South Island from. The largest city in the country by population until about 1900 thanks to the gold rush, Dunedin is now the second-largest city in the South Island and the fifth-largest city in New Zealand. Most famous for its student life at the acclaimed Otago University, Dunedin is also home to a range of must-sees when visiting the South Island. If you travel there in July, you can’t miss the Cadbury Chocolate Carnival’s Giant Jaffa race down Baldwin Street, the steepest street in the world. For some good Kiwi history, take a walk around Larnach Castle and the Dunedin Railway Station, recently restored to its former glory. And if you’re after a solid helping of the great outdoors, a visit to the Royal Albatross Centre or a cycle ride along the Otago Central Rail Trail should be right up your alley. The fourth-largest city with a population of 117,000 people, Hamilton enjoys moderate weather with warm and dry summers and cool and wet winters. If you’re a true LOTR fan, a trip to Hobbiton in Matamata is a must. Gain a first-hand insight into filming of Peter Jackson’s Academy Award-winning Lord of the Rings trilogy, then make like a hobbit when you stroll around Hobbiton and hunch into almost 20 hobbit holes yourself. If you’re a lover of the outdoors, explore New Zealand’s longest river, the Waikato, by boat. Take a stroll around the stunning Hamilton Gardens, surf one of the longest left-hand breaks in the world at Raglan, or get up close and personal with glow worms inside Waitomo Caves. And if you’re after a slice of the exotic, visit Gordonton’s Zealong Tea Estate, where you can enjoy a tour of New Zealand’s only tea plantation and of course a cup of locally-made and -brewed tea. Wellington is both New Zealand’s political capital and cultural capital city. Home to Te Papa, Aotearoa’s national museum, not to mention countless galleries, historical sites, museums and independent exhibitions, Wellington offers something for everyone. While you’re there, take the Cable Car from trendy Lambton Quay up the Botanic Gardens; hike to the top of Mount Victoria for stunning 360-degree views across the harbour; go MP spotting at the Beehive and Parliament Buildings; and enjoy an ice cream at Oriental Bay. Wellington is a movie-lover’s paradise too; visit Miramar and Weta Workshop’s Weta Cave to get up close and personal with New Zealand’s unique movie culture. If you’re after coffee culture or a great night life, Wellington’s got that too. The capital city is also characterised by its wild and unpredictable weather: because it’s perched right at the bottom of the North Island and flanked by the Cook Strait, the weather can be clear and sunny one minute then incredibly windy the next – so remember to pack a jacket! Home to the geographical centre of New Zealand and generally recognised as the sunniest place in the country (although the Hawke’s Bay usually has something to say about that), Nelson is the gateway to the Marlborough Sounds, arguably the most stunning spot in the country. If you’re keen for adventure, kayak or hike the Abel Tasman National Park. If you’d rather relax in the sun, pack a picnic and your sunscreen and take a drive out to the beautiful Kaiteriteri Beach. The Marlborough region produces world-famous New Zealand wine so a visit to a winery followed by some wine tasting is a must. And if you’re a real rugby head, visit the memorial at Botanic Reserve where New Zealand’s very first rugby union match took place in 1870. New Zealand’s sixth-largest city by population and home to the largest port by volume, Tauranga and its surrounding centres are popular cities in the North Island to visit in summer thanks to its beautiful beaches and long sunny days. Take a fishing, sailing, diving or dolphin tour to really make the most of the water, or escape the urban areas by hiking through the Kaimai Mamaku Forest Park. When you’re in Mount Maunganui, climb to the summit of ‘The Mount’ for good cardio and an incredible view of the wider Bay of Plenty, then cool off in the ocean afterwards. New Zealand boasts more than 15,000 kilometres of pristine coastline, so whether you’re after scenic beauty or the adventure of a lifetime, taking a cruise is the perfect way to explore it through any kinds of weather. Most cruises to New Zealand board in Australia or the South Pacific, although round-the-world and Antarctic cruises often stop in at a New Zealand port for a day or two. Some of New Zealand’s main cruise ports include Auckland, Bay of Islands, Gisborne, Tauranga, Napier and Wellington in the North Island, and Marlborough, Akaroa and Stewart Island in the South Island. If you’re after travel filled with everything from adventure and culture to rest and relaxation, make sure you mark Rotorua on your list of cities to visit. Take a ride on the family-friendly luge, then soak away the worries of the world in natural thermal hot pools at the world-famous Polynesian Spa. Learn more about New Zealand’s Maori culture at Tamaki Maori Village, then blow away the cobwebs with a stroll through the beautiful Redwood Forest. Be warned: while Rotorua is an amazing holiday spot for the whole family, you might be startled by the eggy aroma that hits you when you first drive in. This smell is caused by sulphur, a natural mineral that’s produced by Rotorua’s natural thermal mud pools. Steeped in Maori culture and perfect for adventure all year round, Taupo is located alongside New Zealand’s largest lake in New Zealand, right in the centre of the North Island. On a clear day you can see the snow-capped mountains of the Central Plateau across the lake. New Plymouth is home to sun, surf, snow and sheep all in one little city. If you’re lucky, you might see Mt Taranaki peeking through the clouds. Don’t be too discouraged if you don’t though; there’s a running joke that even some New Plymouth residents forget they have a mountain because it’s invisible so often. About 60 minutes north of Auckland, the little township of Mangawhai is a perfect combination of wild east coast surf and intimate beachside village. Pop into Bennetts of Mangawhai for delectable chocolate treats, visit an arts and crafts store, or wander the undisturbed beaches for miles.